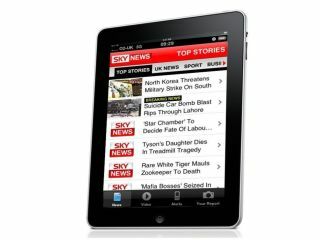 Sky are excited about the potential for Apple's iPad, with the massive success of its popular mobile applications proving that content and services for portable devices is a key new market . Speaking at the IPTV World Forum, Sky's Group Commercial Director Stephen Nuttall – who is soon to leave the company – outlined how powerful mobile applications have become and admitted that the Sky is already keen to see what impact the iPad can have on the media market. "We contend that we have a leading multiplatform strategy that is perhaps more advanced in our thinking than most of our rivals," said Nuttall. "As networks speed up and handsets get ever more capable of delivering entertainment experience, the market is steadily coming to us, as we have always believed that it would." Sky's apps include a remote record application, a Sky Sports branded score centre and Sky Mobile TV – all of which appear to have exceeded expectations. "We've had 4 million downloads of Sky application on the iPhone alone," added Nuttall. "We already see more people choose to remotely program their PVR from their phone than from their PC. Sky mobile TV on the iPhone alone now exceeds that of Sky Player on the PC. But it is the impact of the iPad which is already stirring all of the media industries, and Sky is already looking to the forthcoming Apple device. "Mobile really forces but also grows our business," Nuttall stated, "imagine how we might be able to use the iPad when it comes along." With the Apple device still on course to arrive in the UK by the end of April, we hopefully won't have to imagine for too long.